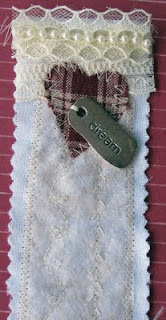 I make a bookmark for today. The idea was in GreenCraft magazine-Summer 2009. The "green" part of the bookmark is a used dryer sheet that was tea dyed for the front center panel. The other green part for me is that I used stuff I already had instead of buying anything new. The dryer sheet didn't seem to take the tea dye very well, but it did color a little. I used a charm instead of printing the word on canvas as suggested in the article. This was fast and fun, and I think I will do another one before long and use a more contrasting thread for the decorative stitching. Very pretty! Dryer sheets are great. I have painted them, too, and they took the color very well. 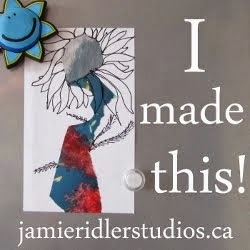 what a great gift idea - I think it came out so very lovely - thanks for sharing it!! What a clever idea to use a dryer sheet. Create Every Day Month is a great time to go through what we already have to create new things. I have a pile of possibilities. way to be green! and "dream" is such a good word. this is a clever project, susie.